CompCert C is a compiler for the C programming language. Its intended use is the compilation of life-critical and mission-critical software written in C and meeting high levels of assurance. It accepts almost all of the ISO C 99 and ANSI C languages, with some exceptions and a few extensions. It produces machine code for the PowerPC, ARM, x86 and RISC-V architectures. Performance of the generated code is decent but not outstanding: on PowerPC, about 90% of the performance of GCC version 4 at optimization level 1. What sets CompCert C apart from any other production compiler, is that it is formally verified, using machine-assisted mathematical proofs, to be exempt from miscompilation issues. In other words, the executable code it produces is proved to behave exactly as specified by the semantics of the source C program. This level of confidence in the correctness of the compilation process is unprecedented and contributes to meeting the highest levels of software assurance. 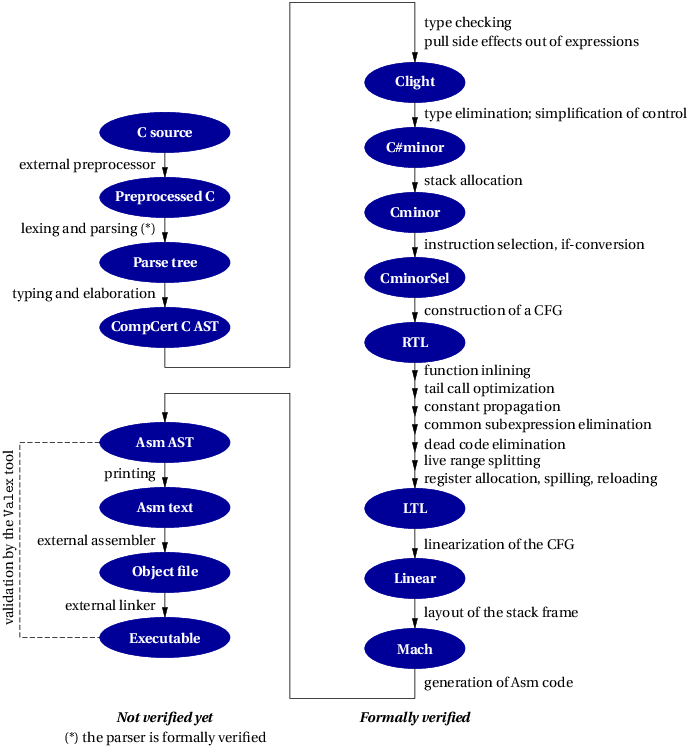 In particular, using the CompCert C compiler is a natural complement to applying formal verification techniques (static analysis, program proof, model checking) at the source code level: the correctness proof of CompCert C guarantees that all safety properties verified on the source code automatically hold as well for the generated executable. 1.1 Can you trust your compiler? For non-critical, “everyday” software, miscompilation is an annoyance but not a major issue: bugs introduced by the compiler are negligible compared to those already present in the source program. The situation changes dramatically, however, for safety-critical or mission-critical software, where human lives, critical infrastructures, or highly-sensitive information are at stake. There, miscompilation is a non-negligible risk that must be addressed by additional, difficult and costly verification activities such as extra testing and code reviews of the generated assembly code. An especially worrisome aspect of the miscompilation problem is that it weakens the usefulness of formal, tool-assisted verification of source programs. Increasingly, the development process for critical software includes the use of formal verification tools such as static analyzers, deductive verifiers (program provers), and model checkers. Advanced verification tools are able to automatically establish valuable safety properties of the program, such as the absence of run-time errors (no out-of-bound array accesses, no arithmetic overflows, etc). However, most of these tools operate at the level of C source code. A buggy compiler has the potential to invalidate the safety guarantees provided by source-level formal verification, producing an incorrect executable that crashes or misbehaves from a formally-verified source program. The CompCert project puts forward a radical, mathematically-grounded solution to the miscompilation problem: the formal, tool-assisted verification of the compiler itself. By applying program proof techniques to the source code of the compiler, we can prove, with mathematical certainty, that the executable code produced by the compiler behaves exactly as specified by the semantics of the source C program, therefore ruling out all risks of miscompilation . Compiler verification, as outlined above, is not a new idea: the first compiler correctness proof (for the translation of arithmetic expressions to a stack machine) was published in 1967 , then mechanized as early as 1972 using the Stanford LCF proof assistant . Since then, compiler verification has been the topic of much academic research. The CompCert project carries this line of work all the way to a complete, realistic, optimizing compiler than can be used in the production of critical embedded software systems. then the observable behavior of C improves on one of the allowed observable behaviors of S.
Second, the compiler is allowed to select one of the possible behaviors of the source program. The C language has some nondeterminism in expression evaluation order; different orders can result in several different observable behaviors. By choosing an evaluation order of its liking, the compiler implements one of these valid observable behaviors. Third, the compiler is allowed to improve the behavior of the source program. Here, to improve means to convert a run-time error (such as crashing on an integer division by zero) into a more defined behavior. This can happen if the run-time error (e.g. division by zero) was optimized away (e.g. removed because the result of the division is unused). However, if the source program is known to be free of run-time errors, perhaps because it was verified using static analyzers or deductive program provers, improvement as described above never takes place, and the generated code behaves exactly as one of the allowed behaviors of the source program. How do we define the possible behaviors of a source or executable program? This is the purpose of a formal semantics for the corresponding languages. A formal semantics is a mathematically-defined relation between programs and their possible behaviors. Several such semantics are defined as part of CompCert’s verification, including one for the CompCert C language and one for the Asm language (assembly code for each of the supported target platforms). These semantics can be viewed as mathematically-precise renditions of (relevant parts of) the ISO C 99 standard document and of (relevant parts of) the reference manuals for the PowerPC, ARM, RISC-V and x86 architectures. What does semantic preservation tell us about source-level verification? Let Σ be a set of acceptable behaviors, characterizing a desired safety or liveness property of the program. Assume that a source program S satisfies Σ: all possible observable behaviors of S are in Σ. Then, the compiled code C satisfies Σ: the observable behavior of C is in Σ. The purpose of a sound source-level verification tool is precisely to establish that a specification Σ holds for all possible executions of a source program S. The specification can be defined by the user, for instance as pre- and post-conditions, or fixed by the tool, for instance the absence of run-time errors. Therefore, a formally-verified compiler guarantees that if a sound source-level verification tool says “yes, this program satisfies this specification”, then the compiled code that really executes also satisfies this specification. In other words, using a formally-verified compiler justifies verification at the source level, insofar as the guarantees established over the source program carry over to the compiled code that actually executes in the end. How do we conduct the proof of semantic preservation? Because of the inherent complexity of an optimizing compiler, the proof is a major endeavor. We split it into 15 separate proofs of semantic preservation, one for each pass of the CompCert compiler. The final semantic preservation theorem, then, follows from the composition of these separate proofs. For every pass, we must prove semantic preservation for all possible input programs and for all possible executions of the input program (there can be many such executions depending on the unpredictable results of input operations). To this end, we need to consider every possible reachable state in the execution of the program and every transition that can be performed from this state according to the formal semantics. The proofs take advantage of the inductive structure of programming languages: for example, to show that a compound expression a + b is correctly compiled, we assume, by induction hypothesis, that the two smaller subexpressions a and b are correctly compiled, then combine these results with reasoning specific to the + operator. If the compiler proof were conducted using paper and pencil, it would fill hundreds of pages, and no mathematician would be willing to check it. Instead, we leverage the power of the computer: CompCert’s proof of correctness is conducted using the Coq proof assistant, a software tool that helps us construct the proof in interaction with the tool, then automatically re-checks the validity of the proof [2, 11]. Such mechanization of the proof brings near-absolute confidence in its validity. How effective is formal compiler verification? Preprocessing: file inclusion, macro expansion, conditional compilation, etc. Currently performed by invoking an external C preprocessor (not part of the CompCert distribution), which produces preprocessed C source code. Parsing, type-checking, elaboration, and construction of a CompCert C abstract syntax tree (AST) annotated by types. In this phase, some simplifications to the original C text are performed to better fit the CompCert C language. Some are mere cleanups, such as collapsing multiple declarations of the same variable. Others are source-to-source transformations, such as pulling block-local static variables to global scope, renaming them if needed to keep names unique. (CompCert C has no notion of local static variable.) Some of these source-to-source transformations are optional and controlled by command-line options (see section 3.2.9). Production of textual assembly code, followed by assembling and linking. The latter two passes are performed by an external assembler and an external linker, not part of the CompCert distribution. As shown in Figure 1.1, only phase 3 (from CompCert C AST to Asm AST) and the parser in phase 2 are formalized and proved correct in Coq. One reason is that some of the other phases lack a mathematical specification, making it impossible to state, let alone prove, a correctness theorem about them. This is typically the case for the preprocessing phase 1. Another reason is that the CompCert effort is still ongoing, and priority was given to the formal verification of the delicate compilation passes, especially of optimizations, which are all part of the verified phase 3. Future evolutions of CompCert will move more of phase 2 (unverified simplifications) into the verified phase 3. For phase 4 (assembly and linking), we have no formal guarantees yet, but the Valex tool, available from AbsInt, provides additional assurance via a posteriori validation of the executable produced by the external assembler and linker. Register allocation using graph coloring and iterated register coalescing, to keep local variables and temporaries in processor registers as much as possible. Instruction selection, to take advantage of combined instructions provided by the target architecture (such as “rotate and mask” on PowerPC, or the rich addressing modes of x86). Constant propagation, to pre-evaluate constant computations at compile time. Common subexpression elimination, to avoid redundant recomputations and reuse previously-computed results instead. Dead code elimination, to remove useless arithmetic operations and memory loads and stores. Function inlining, to avoid function call overhead for functions declared inline. Tail call elimination, to implement tail recursion in constant stack space. Loop optimizations are not performed yet. x86 in 32-bit mode (also known as IA32) and in 64-bit mode (also known as AMD64). In 32-bit mode, SSE2 extension are required. They have been available on all Intel models since Pentium 4 and all AMD models since Athlon 64. RISC-V in 32-bit and in 64-bit modes. Other operating systems that follow one of the ABI above could be supported with minimal effort. switch statements must be structured as in MISRA-C ; unstructured switch, as in Duff’s device, is not supported. Variable-length arrays are not supported. Consequently, CompCert supports all of the MISRA-C 2004 subset of C, plus many features excluded by MISRA-C, such as recursive functions and dynamic heap memory allocation. The _Alignof operator and the _Alignas attribute from ISO C 2011. Anonymous structures and unions from ISO C 2011. Pragmas and attributes to control alignment and section placement of global variables. Figure 1.2: Performance of CompCert-generated code relative to GCC 4.1.2-generated code on a Power7 processor. Shorter is better. The baseline, in blue, is GCC without optimizations. CompCert is in red. On PowerPC and ARM, the code generated by CompCert runs at least twice as fast as the code generated by GCC without optimizations (gcc -O0), and approximately 10% slower than GCC 4 at optimization level 1 (gcc -O1), 15% slower at optimization level 2 (gcc -O2) and 20% slower at optimization level 3 (gcc -O3). These numbers were obtained on the homemade benchmark mix shown in Figure 1.2. By lack of aggressive loop optimizations, performance is lower on HPC codes involving lots of matrix computations. The IA32 architecture, with its paucity of registers and its inefficient calling conventions, is not a good fit for the CompCert compilation model. This results in performance approximately 20% slower than GCC 4 at optimization level 1. CompCert attemps to generate object code that respects the Application Binary Interface of the target platform and that can, therefore, be linked with object code and libraries compiled by other C compilers. It succeeds to a large extent, as summarized in the following two tables. On x86 and PowerPC, CompCert maps the long double type to 64-bit FP numbers, while the x86 ABIs mandate 80-bit FP numbers and the PowerPC EABI mandates 128-bit FP numbers. This causes ABI incompatibilities for the layout of structs having fields of type long double, as well as for passing function arguments or returning function results of type long double. On ARM with the “hard floating-point” variant of EABI, an incompatibility occurs when values of struct types are passed as function arguments or results, in the case where these values are composed of 1 to 4 floating-point numbers. The hard floating-point EABI uses 1 to 4 VFD registers to pass these structs as function arguments or return values, while CompCert uses integer registers or memory locations as in the default “soft floating-point” EABI. On x86 in 64-bit mode, CompCert currently passes arguments of struct and union types in a completely different way than that specified by the x86-64 ABI. This is due to the complexity of this ABI and the very recent introduction of x86-64 support in CompCert, and should be improved in future releases. On RISC-V, CompCert currently passes arguments of struct and union types in a different way than that specified by the RISC-V ABI. Also, long double is 16 bytes in the ABI but 8 bytes in CompCert. Layout of bit-fields in struct types: Several incompatibilities with the ELF ABIs are known for bitfields of type _Bool, char or short, and also for bitfields of type int that could share storage with a regular field of type char or short. If the structure contains only bitfields of type int and regular fields of type int or bigger, the layout conforms to the ELF ABI. unsigned int if the total size is between 17 and 32 bits. Within the carrier field, bit offsets are assigned to the members of the group, starting with bit 0 for little-endian platforms and bit 7/15/31 for big-endian platforms. The process is then repeated with the remaining bitfields. A bitfield of width 0 always terminates a group. In the second layout pass, the fields (regular fields of the original struct and carrier fields for bitfield groups) are laid out consecutively, at byte offsets that are multiples of the natural alignments of their types. Padding can be introduced between two consecutive fields in order to satisfy alignment constraints. Note that for bitfields, the type given to the bitfield in the C source (int or short or char, possibly signed or unsigned) is ignored as far as the layout is concerned. The width of the bitfield is only checked to be less than or equal to the bit size of the type. In contrast to this, the ELF ABI documents describe a single-pass, greedy layout algorithm. Key differences to CompCert’s algorithm are that named bitfields of type T are always located in storage units with size sizeof(T) with an alignment of alignof(T). It is also possible that storage units for bitfields overlap with storage units for regular fields. CompCert packs the two bitfields in a carrier field of type char. The resulting struct size and alignment are 1 byte. ELF shares a storage unit of type int between the two bitfields. Therefore the resulting struct size will be 4 bytes with an alignment to 4 bytes. CompCert packs all three bitfields in a carrier field of type int. Size and alignment are therefore 4 bytes. ELF cannot share storage units of type short between any two bitfields. Hence, three short storage units are used. This results in a struct size of 6 bytes with an alignment to 2 byte addresses. If the type of the three bitfields would be int instead of short the ELF algorithm would result in the same layout as CompCert: a single int storage unit enclosing all three bitfields with size and alignment of 4 bytes. This example shows that the ELF layout, taking the type of bitfields into account during layout, has fewer opportunities for packing data of types char and short, but a reduced alignment size. CompCert’s layout algorithm never merges bitfields and regular fields together. Hence, x starts at byte offset 0, followed by 3 bytes of padding, and y starts at byte offset 4. The total struct size will be 8 bytes with an alignment to 4 bytes. ELF is able to overlap x’s byte with the int storage unit for y. Hence, x is located at byte offset 0 and y starts at byte offset 1. No padding is introduced and the total size and alignment of the struct will be 4 bytes.